7" Double Chamber Bubbler - Blue -The Greatest Online Smoke Shop! It is like having 2 bubblers in 1! Double the filtration, double the smoother smoke! Made of thick and high quality borosilicate glass. It is like having 2 bubblers in 1! Double the filtration, Double the smoother smoke! Made of thick and high quality borosilicate glass. Each chamber is filled with water and it will force the smoke to be percolated twice. 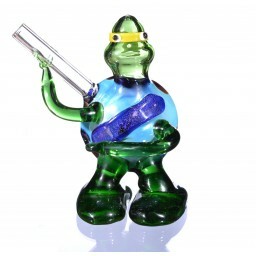 This piece itself is gorgeous with numerous bead accents around the clear part of the pipe. The neck of the pipe has a double ring accent. The down steams have a spiral design on them. A lot of detail and workmanship went into making these pipes. 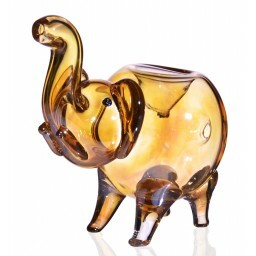 This glass item is individually hand-blown and beautifully handcrafted. Colors of bead accents and spirals may vary slightly from photos, making yours a one of a kind item! However it will be Blue. 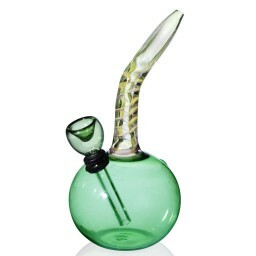 Great glasswork, smokes smoothly, durable.